We present two novel optimizations for compiling High Per- formance Fortran (HPF) to page-based software distributed shared mem- ory systems (SDSM). One technique, compiler-managed restricted con- sistency, uses compiler-derived knowledge to delay the application of memory consistency operations to data that is provably not shared in the current synchronization interval, thus reducing false sharing 1 . The other technique, compiler-managed shared buffers, when combined with the previous optimization, eliminates fragmentation 2 . 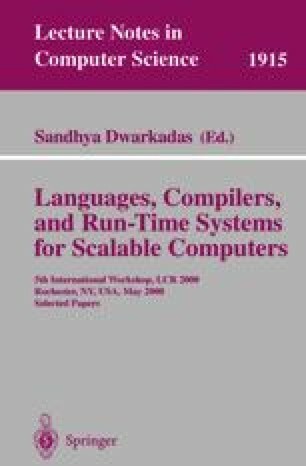 Together, thetwo techniques permit compiler-generated code to effciently apply multi- dimensional computation partitioning and wavefront parallelism to exe- cute efficiently on SDSM systems. False sharing occurs when two or more processors each accesses mutually disjoint sets of data elements in the same block. Fragmentation occurs when an entire block of data is communicated to transport only a small fraction its content.